You are encouraged to experience the beauty of the Campbellton waterfront. 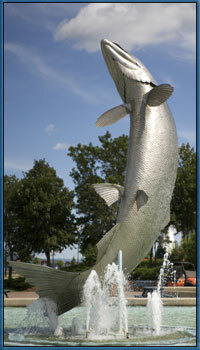 Visit our picturesque Salmon Plaza; located there is Restigouche Sam, an 8.5 meter stainless steel model of the region's famous salmon. You'll also find many other attractions within walking distance, such as our one-of-a-kind light-house that serves as a youth hostel during the summer months, a Provincial Tourist Information Center and gift shop and Atlantic Canada's most complete recreation facility, the Campbellton Regional Memorial Civic Center. July and August - Live Entertainment at the Campbellton Amphitheater, Thursday and Saturday evenings. July and August - Live Entertainment at the Campbellton Kiosk Park, Wednesday and Sunday evenings.